Our skilled crew of carpenters can complete your Bathroom Remodeling project with ease and expertise, no matter how large or small the project. Morris County and North Jersey. 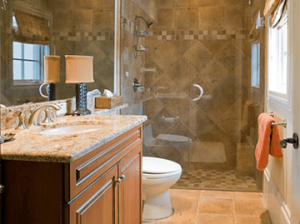 A&E Home Remodeling prides itself on being Morris County’s premiere bathroom remodeling expert. Our specialists have been meticulously combing function, design, style, and cost-effective solutions to home owners for over twenty-five years. A&E’s approach to bathroom remodeling is simple: Communication, attention to detail, and execution. We listen to our clients, which is essential to understanding your bathroom remodeling needs. Attention to detail – from the color of the grout to the type of exhaust fan – is a priority to point out everything every step of the way. No detail is overlooked, which ensures a beautiful and functional bathroom. Efficient job execution is crucial in delivering a beautiful bathroom with minimal disruption of your daily routine and family.